PhD Thesis at the University of Technology, Sydney, 2003, ‘Performing the Past: A Cultural History of Historical Re-enactments’. First academic thesis to document and analyse the development, cultural practices and interpretative strategies of historical re-enactments and ‘living history’ museums. The thesis explored interconnections between performance and history. Tutor, lecturer, course coordinator - Public History, Australian History and the history of Colonialism at the University of Technology 1997-2003. Consultant Historian and exhibition curator in a wide range of projects for various government bodies, industry, individuals and the media 1997-2009. 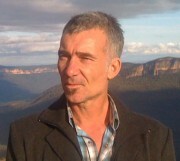 2003 to 2009 co-director of Historica Pty Ltd, Australia’s first dedicated History Events Management Company and managed Historica’s Heritage Projects division. Historica linked historians and cultural production such as commemoration, celebration and film and television. The Heritage Projects division managed a variety of history and heritage projects such as major written and oral histories, exhibitions and interpretive displays and installations. Since 2010 I have been employed as Curator of Environment, Shipping & Industry at the Australian National Maritime Museum, curating several exhibitions including Vikings - Beyond the Legend, War at Sea - The Navy in WWI and Black Armada - Australian support for Indonesian Independence 1945-1949. In 2011 I won the NSW Premier's History Award for Regional and Community history with my publication Cabrogal To Fairfield: A History of a Multicultural City. 2016 Endeavour Professional Fellowship to Swedish History Museum and Swedish Maritime Museums, Stockholm, Sweden. Currently working on a book about early colonial Sydney military history. Australian maritime history - shipping, trade, industry and maritime environmental history. Public History and historical reenactments. Newington College: 150 Year History; 1863-2013, Newington College, Stanmore, NSW, 2012. Front Pages That Shaped Australia Pier 9 Press, Murdoch Books, Sydney, 2010. Cabrogal To Fairfield: A History of a Multicultural City Fairfield City Council, Fairfield NSW, 2010. The Terror of Western Sydney: Jack Donohoe the original Wild Colonial Boy Mt Druitt Historical Society Monograph series, 2009. Fairfield: Evolution of a Migrant City Fairfield City Council Museum and Gallery, Fairfield, NSW, 2008. ‘Black-facing for the Explorers’ in Vanessa Agnew & Jonathan Lamb eds., Re-enacting Settler, Indigenous and Creole Histories Harvard University Press 2009. ‘Mobile Monuments: Commemoration and Historical Re-enactment’ in Paul Pickering and Iain MacCalman eds., Re-enactment and Realism Harvard University Press 2009. ‘Convict Sydney’ Exhibition review, History Australia Volume 8, Number 4, April 2011). ‘Cockatoo Island, Sydney Harbour Federation Trust, Sydney, Australia’ International reviews, The Public Historian: Journal of the National Council for Public History (USA) Fall 2011. ‘Historical Reenactment and the Ruins of Colonialism’ Catalogue Essay for Cordiero-Healy exhibit at the 2010 Venice Biennale, NSW Ministry of the Arts, 2010. ‘Adventures in the Colony: Big Brother meets Survivor in period Costume’ in Journal of Film & History, Spring 2007.